The Honor brand is all about challenging the premium smartphone market by making feature-rich devices at an affordable price point, and that’s no exception here with the Honor 8X. This device is feature faced with a 6.5 inch Notch Full View 1080p display in 19.5:9 widescreen aspect ration and provides 91% screen-to-body ratio. 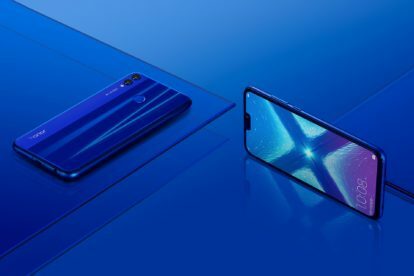 The new Honor 8X focuses on minimalist design and uses a middle metal frame with a 2.5D second texture aurora glass body with the grating effect which makes the phone reflect different colors and light from different angles. Internally there is a Kirin 710 octa-core processor combined with 4 GB or 6 GB RAM options and the options of 64 GB or 128 GB of build in storage with a micro SD card slot to expand storage up to 400 GB. For the battery, there is 3750 mAH than Honor claims should last for more than one day. The software running is Android Oreo with EMUI 8.2. The biggest highlight of the Honor 8X is the cameras. The rear camera is a dual camera setup with 20 megapixels + 2 megapixels. F/1.8 aperture sensors that use Honor’s AI system to improve image quality. The AI system recognizes 22 different categories and 500 scenarios in real-time. The AI technology optimizes camera settings and enhances photo quality based on what you are shooting. The AI introduces deep learning technology which allows precise segmentation of various elements within an image. For example, the AI can recognize people, trees and the sky in a photo, and retouch and optimize according to what they are, to achieve the best result. Honor 8X’s AI technology eliminates the blurring of pictures when taking night shots under a maximum 6-second exposure, even with a shaky hand. It’s a challenge for a smartphone camera to take night shots without a tripod. Honor 8X’s multi-frame stabilization technology based on machine learning takes perfect handheld night shots. The 16MP front camera has an enhanced-ISO, with 4 Cell fusion technology and multi-frame image processing, to allow 2 times more light to be captured by the camera. The Honor 8X is packing some high power, and the price should make it a very attractive buy, but we don’t know the price or release date just yet. We should get this information coming soon for which we will update this post with that info once release.